Fred. Olsen Windcarrier’s jack-up installation vessel Brave Tern has successfully mobilised for the Block Island Offshore Wind Farm project in Esbjerg, Denmark. Mobilisation included welding of large steel structures on deck to elevate and support the nacelles for the planned transatlantic voyage. Brave Tern is now en route to St. Nazaire, France, where the 5 GE Renewable Energy’s Haliade 150-6MW nacelles will be waiting to load onto the vessel. After load-out the vessel will transit across the Atlantic to install the turbines at Block Island Wind Farm before returning to Europe. Wind lidar, ZephIR 300, is installed on Fred. 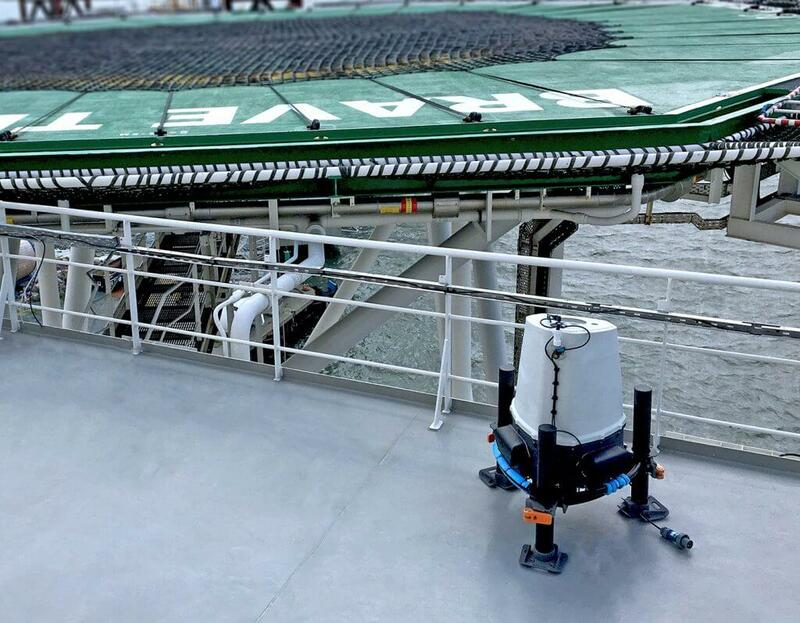 Olsen Windcarrier’s Brave Tern during the Block Island Wind Farm project to complement the onboard technology with delivery of real-time accurate wind information to the crew. ZephIR Lidar is proud to continue working on the Deepwater Wind project having already provided wind resource assessments since 2011 and the deployment of the ZephIR 300 for this application demonstrates Fred. Olsen Windcarrier’s commitment to improve the efficiency and safety of complex offshore construction operations. ZephIR 300 wind lidars deliver real-time wind information, remotely from 10 metres above installed location up to 200 metres. Used in all stages of wind farm development and other meteorological applications such as offshore platforms (both fixed and floating), ZephIR 300 is also being used here through the construction phase to assist crane operations and safe lifting. Enhanced understanding of suitable weather windows for craning operations will enable craning operations to be optimised leading to more efficient and cost effective offshore construction operations. The data, presented as a wind shear profile including wind speed and wind direction is directly accessible via a User Interface from a display screen accessible to the client. ZephIR Lidar provides hub height and turbine mounted accurate wind measurement, for wind energy and meteorological applications. These industry leading wind lidar products, ZephIR 300 and ZephIR DM, provide accurate wind measurements, in both onshore and offshore applications. With more than 10 million hours of operation in the field and over 1000 deployments (and counting) we have pioneered the use of lidar in the wind industry. We have many world firsts including upwind measurements from a turbine nacelle, turbine wake studies, offshore deployments both fixed and floating wind lidar, an industry-accepted validation process, re-financing and re-powering a wind farm, technology accuracy demonstration in a wind tunnel and total project financing. The successful deployment of the ZephIR 300 for this application demonstrates the benefits of the ZephIR continuous wave Lidar technology. Offshore applications such as this will be ideally served through the deployment of ZephIR’s recently launched, and Marine grade wind lidar, ZephIR 300M.